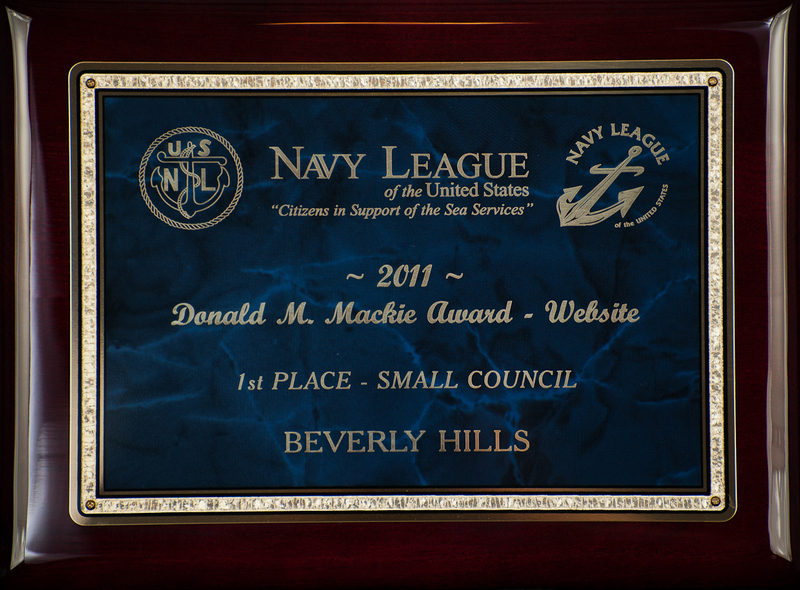 To this end, the Navy League works closely with the Navy, Marine Corps, Coast Guard, and US-flag Merchant Marine through a network of over 330 Councils in the United States and around the world. 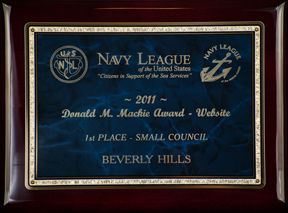 The Navy League has approximately 70,000 active members. The Navy League supports America's young people through its youth programs, including sponsorship of the US Naval Sea Cadet Corps, the Navy League Scholarship Program, and the Samuel Eliot Morison Essay Contest. Individual Councils are also involved in promoting youth-oriented activities in their communities such as NJROTC, MCJROTC, and ROTC units along with other recognized youth programs. Local councils and national headquarters provide over $250,000 in scholarships and awards every year. "It seems to me that all good Americans interested in the growth of their country and sensitive to its honor, should give hearty support to the policies which the Navy League is founded to further. The Navy Jack flown aboard the USS DEWEY (DDG 105), an Arleigh Burke-class guided missile destroyer is the third U.S. Navy ship to be named after Admiral of the Navy George Dewey. The ship was commissioned at the Navy Weapons Station in Seal Beach, California on Saturday, March 6, 2010. This was the first ship commissioning for the City of Seal Beach. The First Navy Jack is the current U.S. jack authorized by the United States Navy and is flown from the jack staff of commissioned vessels of the U.S. Navy while moored pier side or at anchor. The design is traditionally regarded as that of the first U.S. naval jack flown in the earliest years of the republic. In late 1775, as the first ships of the Continental Navy readied in the Delaware River, Commodore Esek Hopkins issued, in a set of fleet signals, an instruction directing his vessels to fly a "striped" jack and ensign. The exact design of these flags is unknown. The ensign was likely to have been the Grand Union Flag, and the jack a simplified version of the ensign: a field of 13 horizontal red and white stripes. It is likely that the colonial ships did not use (and could not have legitimately used) the canton of the Grand Union Flag (i.e., the Union Jack) as their jack given its use as a jack by Royal Navy warships. 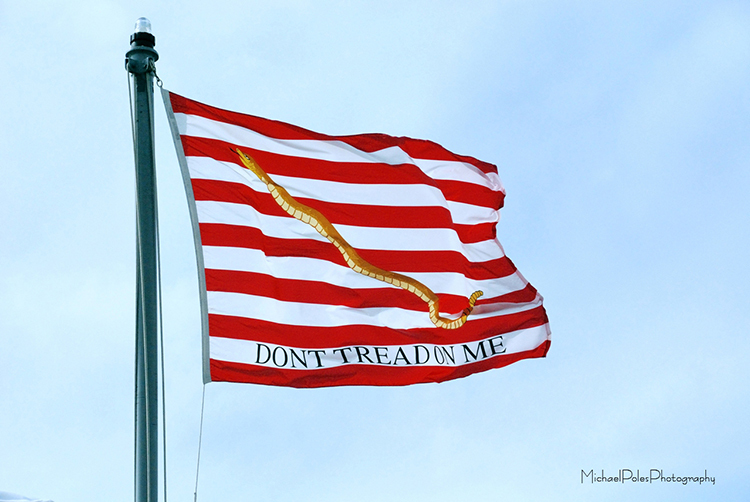 Despite the probability that the original jack may have been a simple striped flag, since about 1880, this jack has traditionally been depicted as consisting of thirteen red and white stripes charged with an uncoiled rattlesnake and the motto "Don’t Tread on Me." This tradition dates at least back to 1880, when this design appeared in a color plate in Admiral George Henry Preble's influential History of the Flag of the United States. Recent scholarship, however, has demonstrated that this inferred design never actually existed but "was a 19th-century mistake based on an erroneous 1776 engraving"